Suitable for media temperatures between -50 and + 1,000 °C, EGE’s stainless steel temperature sensor TGM 025-03 is designed to monitor hot gases. 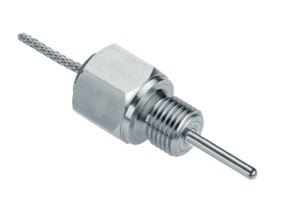 The compact unit is integrated by means of a G¼ thread and uses a type K thermocouple to register temperatures. The TGM 025-03 sensor is operated with EGE’s TKM amplifier, but can be connected to any other standard amplifier for type K thermocouples.